Tracking engagement of members is now much easier with our Newsletter feature in Analysis. Newsletter allows a quick review of who was sent a given Newsletter and assess whether the user received, opened, bounced, or complained about the email. Go to Analyze on the top menu in Admin. Select Newsletter from the left menu. Find the newsletter you would like to analyze, then click Details to see how members engaged with it. 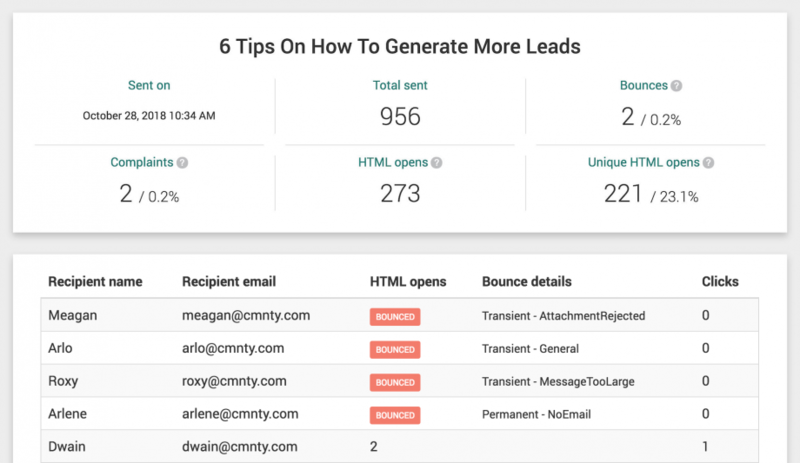 Newsletter analysis offers email tracking for emails sent from the platform. When turned on, member engagement to emails will be tracked and shown when reviewing the analysis for a given newsletter. Go to Configure on the top menu in Admin. Select Email Settings under Email drop-down. Switch Enable Tracking to On. The Newsletter Insights page uses a few terms which are helpful to know to get a better understanding of how members are engaging with these emails. HTML Opens records the amount of opens of the email. Only email which are being viewed with rich content like images are being counted. Emails in which the images are disabled or no images at all are displayed, will not be counted as opened. Bounce emails can either be soft-bounces or hard-bounces. A soft bounce can occur for example when the mailbox is too full or when the mail server was down. A hard bounce occurs for example when the email address does not exist or is invalid. Currently CMNTY Platform does not make a difference between both. Complaints occur when the receiver clicks the “report as spam” button or does a similar action like informing their internet provider about email abuse.